When you want your firearm accessories to work just as they’re meant to, it’s hard to justify buying anything other than those made by the manufacturer. This 17 round magazine is exactly that, a high quality piece of equipment by Glock that’s made to work seamlessly in your Gen 4 G17 pistol. 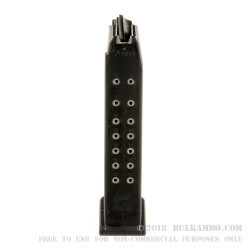 This drop-free magazine features a sturdy steel frame enveloped by Glock’s own patented heavy duty polymer, so it is ready to withstand any mistreatment that a tough and uncertain world might subject it to. Its double cut magazine body will work regardless of which side you prefer keeping your mag release on, and its supple metal spring will keep its elasticity even after you’ve loaded thousands of cartridges into it. The magazine’s base plate is made of flat polymer which will blend seamlessly into your pistol’s design. 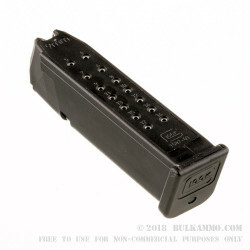 Even if you’ve already got a magazine for your Glock, having another is always beneficial. Knowing you can perform a fast reload if the stuff ever hits the fan is comforting, and training at the range is always more fluid if you’ve got a buddy to take turns loading mags with.